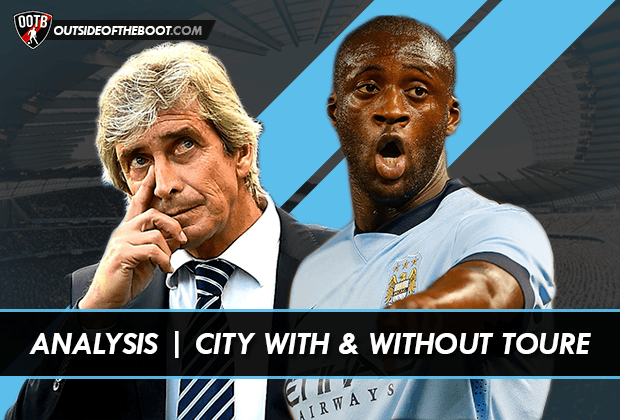 Yaya Toure has thus far been an integral part of Manchester City’s tactical game-plan. Adam Bailey takes a look at what the Ivorian brings, and what his absence could mean for the side. Earlier this week, the Guardian linked Manchester City with a colossal £35m move for Everton midfielder Ross Barkley. The report coincides suspiciously with the deteriorating form of Yaya Touré. The Ivorian claimed Manchester City’s Player of the Season award last term after contributing 20 goals and nine assists to the club’s second Premier League title win in three years, but a summer infected by the tragic loss of a brother, a disappointing World Cup and the interference of a gluttonous agent has certainly affected the midfielder’s on-field conduct so far this campaign. After such a tyrannic exhibition of brute force, speed and technical elegance in City’s 2013/2014 crusade, one would expect Touré to be forgiven for his underwhelming start to this season. But the inhuman qualities previously shown by the midfielder has denied him of any sympathy from the Etihad faithful, and his commitment to the club has been thrown into question. Manchester City fans must realise that the 31-year-old, vulnerable to both the physical and emotional demands of the profession like any other footballer, will never replicate the form he hit a season ago. Although he offers muscular presence, power and pace in the heart of the midfield, his ability to channel those attributes into dominant performances is eroding. Manuel Pellegrini must start to sound-out possible replacements for possibly the Premier League’s best ever box-to-box midfielder, but for now, the Chilean cannot afford to drop Touré from his starting eleven. The four time CAF African Footballer of the Year still remains one of the most intimidating opponent in the division. Touré’s ability to switch positions in the middle of the game also renders him a vital cog in Manuel Pellegrini’s starting eleven. In a 4-4-2 formation alongside Fernandinho, Yaya sits in a deeper midfield role and his Herculean frame offers valuable protection in front of the defence. The midfielder may complete more of his attractive work further up the field, but he made 34 clearances and 24 interceptions last term that were equally as important to City’s title win. Going forward, however, Yaya in undeniably the most carnivorous attacking midfielder in the league. The £12m acquisition of Fernando Reges from FC Porto means a 4-5-1 formation could be employed on a regular basis this season, and the Brazilian could form a rigid partnership with compatriot Fernandinho to provide Touré with an even sturdier base on which to launch his marauding runs from. His frequent surges into the 18-yard-box often originate from central positions. Out of his five goals from outside the box last campaign, four of them came from central positions, evidencing the directness of the midfielder’s play. Touré roams the pitch in a vertical fashion, and his central orientation allows David Silva and Samir Nasri to prowl areas just behind the striker in a more horizontal pattern. The Ivorian likes to occupy central positions just behind the striker which presents David Silva, Samir Nasri and Sergio Agüero with the space to orbit around him. Power has always been the Ivorian’s primary asset, and he used it to his advantage in City’s 1-1 draw with Chelsea last weekend. Nemanja Matić controlled last season’s equivalent fixture with his physicality, but Yaya’s presence deep in the midfield prevented the Serbian from influencing proceedings on Sunday afternoon. Touré is still capable of unleashing a predatory drive into the opposition’s penalty area. A wicked concoction of raw strength and speed makes defending against the former-Barcelona man a near-impossible task, and no other player in City’s midfield possesses the command Yaya has going forward. With Yaya Touré in the starting eleven, Manchester City have a base to retreat to in the midfield. Sergio Agüero, Samir Nasri and David Silva occupy relatively free roles in Manuel Pellegrini’s attacking system and are relied upon to unlock and penetrate defences. Touré’s presence alongside them and willingness to accept the ball in tight spaces gives City’s more creative players an outlet when they are closed down by defenders, and the Ivorian is then able to hold onto the ball and release it once his teammates have found space. Touré is often seen in close proximity to Samir Nasri and David Silva, and the trio’s understanding aids City in unlocking defences. The one touch triangles Nasri, Silva and Touré often practice have become a seductive characteristic of City’s attacking play, but the removal of the 31-year-old from that trio has been proven to disrupt the flow of their football. The blues have lacked pace going forward in their first five Premier League encounters, and Yaya’s passivity has been largely responsible for the leisurely tempo. Samir Nasri and David Silva are creators, but Touré is an attacking machine with an extraordinary appetite for goals. Manuel Pellegrini cannot afford to drop a player with the capability to alter the momentum of a game in a second. Manchester City’s 2-2 draw against Sunderland in April gave Manuel Pellegrini a painful view of how important the African is to the rhythm and tempo of his midfield. Touré was ruled out through injury, forcing an unimaginative partnership between Javi García and Fernandinho. The lack of pace in the side created a tremendous gap between attack and midfield that Touré often fills, and Sunderland were able to exploit the space and counter attack effectively in his absence. More recently, Yaya was left out of City’s squad in their 2-2 draw against Arsenal at the Emirates Stadium, and his omission allowed Arsenal to control the first half of the tie through their midfield. Frank Lampard and Fernandinho formed an experienced couplet in the heart of the midfield, but their lack of agility allowed the Gunners to overrun them. Lampard’s deteriorating energy levels also forced Fernandinho into an unfamilar role much higher up the field, and when Arsenal attacked, he struggled to help his English partner shield the defence. Without Touré occupying the role just behind the striker, Fernandinho is forced into unfamiliar territory leaving Lampard to fend for himself against a five-man Arsenal midfield. Without the 31-year-old’s acceleration and clout in the midfield, City lose a sense of urgency going forward. Silva, Nasri and Fernandinho are patient passers of the ball and will eventually unlock defences with their vast imaginations, but Touré’s impatience and willingness to drive forward establishes a fruitful relationship between attack and midfield. Severe that relationship, and City risk surrendering their title this season. Video Analysis: How did Borussia Dortmund lose the Revierderby to Schalke?